Bart’s column makes the case that the pendulum has swung back to where it was a decade or so back, when certification was pretty much a requirement for any technical job. Only now, there’s a new wrinkle in the era of outsourcing: Perkins argues that if your job gets outsourced, your certifications might determine whether you get a chance to go with it. Perkins also predicts that as today’s certified IT Pros become IT Managers, certification will become a more common requirement, even (and especially) for senior positions. One of the things I saw of course was the predictable “Certifications don’t matter” haters that come out of the woodwork every time the topic of certification value comes about. To those individuals, I’ll simply say this. I’ve been with Microsoft for 15 years & in IT 9 years prior to that. More specifically, I’ve been involved with dozens of interview “loops” (as they call them) and to be blunt, if you don’t have the appropriate certification in the technology that you’re applying for here at Microsoft, my first instinct is that I’m not likely going to greenlight your resume to move on. Does a certification matter that much? Frankly, from a technical standpoint NO. What it tells me however is that above all else, the applicant has the right attitude. Someone that’s gone through the process of taking a test – especially if they don’t need to – and passing it is someone that is interested in details, in this case, personal details about their professional appearance. Someone that’s willing to do anything & everything to do a job right. Someone that doesn’t have a chip on their shoulder about their skills. Someone that doesn’t think they’re so much better than anyone else that they can cut corners. Skills can be taught but attitude can rarely be adjusted permanently. His response was something along the lines of, “Well, I don’t really see the value in me doing that considering my experience but if Microsoft’s going to pay for the exam, yeah, I’ll take it.” For those reading, that’s not the right answer. The rest of his responses had a similar tone. When I met with the other interviewers to provide our feedback about the candidates, let’s just say that his resume was filed appropriately. 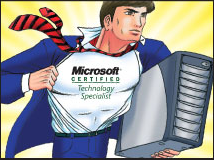 Say what you want about their necessity: If you only have experience with a certifiable product in 2-3 organizations, I’m going to feel a lot more comfortable with you as a candidate if you have a certification in that technology. Why? Very simply put, I’ve worked in IT for 9 years previously and I know that every environment, once set, rarely changes much meaning that one’s skill set is usually confined to only one scenario/scope in which a given technology is used. This is EXTREMELY limiting. EXAMPLE: I met one candidate and he’d been using one of our technologies for 5 years. We joked that he had seen been through the good times and the bad with the product and based on the amount of time he’d spent on the technology as well as his clear memory of previous revisions, I went to far in my mind as to think for a moment that we might be looking at a possible fit. And then I noticed his resume lacked the right certification. So I started asking about his prior employer’s environment and he naturally could answer technical questions about that particular configuration. But the moment we started talking about architectures different from that which he’d used at his previous employer, he just lost it. Sputtering and complaining about how those were “non-enterprise” configurations without a lot of substantiating evidence, I soured on him quickly. I made a point of telling him that our customers work in configurations that were downright unnatural at times and that the position required a lot of understanding and flexibility. He practically shut down after that. ”Effort” is not to be confused with “Attitude”. This has to do with fundamental work ethic. Someone that’s willing to go the extra mile. Someone that is willing to do the basic fundamentals necessary for success. Someone that’s not looking for a quick out, someone that’s willing to put their ego aside, and someone that’s willing to do the entry-level drudgery to be a team member & a part of the group. EXAMPLE: There was one guy that we hired, despite the fact that I (and another person) didn’t give him the “thumbs up” and he didn’t have any of the traditional certifications we’d expect of a candidate. He was hired based on his knowledge of our competitor’s technology and he ended up, after a month of evaluation, being nowhere near technically qualified to work in the role he was hired into. It was clearly a very big mistake on the part of the hiring manager. A very unusual plan was put into place: The hiring manager had several employees work with the new hire weekly to help him focus on what he needed to study & learn – very rapidly – in order to be successful. The idea was that the gaps in his knowledge could be identified and he could, on his own, study and learn via hands-on work or books, or whatever… enough to provide value to the team in some capacity. Now putting aside whether this was the right thing to do or not, several of our top engineers took time out of their schedules and worked with him to orient him in the right direction. To everyone’s surprise however, instead of working to prove his mettle, the hire didn’t do any studying, training, or research near as we could tell. To make matters infinitely worse, he went to various internal conferences & meetings and effectively bashed his hiring manager and the people that were trying to get him up to speed. He was asked to move along after only 4-6 months. Is the technology skill rare? In these cases, a certification often isn’t required but it’s often damn well SUPER IMPRESSIVE. Take Microsoft’s Unified Communications technologies… or Host Integration Server/BizTalk Server. Or Performance Point Server 2007. Or even Windows Server 2008 R2/Windows 7. I don’t even know if half these products have certifications for them but if they do, and a candidate has the cert – that’s a sign of someone who really wants to work here. How long have they been out of work? Has the candidate been unemployed for a while? If so, it would seem to me that this would be one of those things that they would have worked on between jobs. If not, it’s certainly understandable that a candidate might have been so busy with a previous job that certification wasn’t high on their priority list. It still doesn’t make them more viable a candidate when compared to someone that does have their cert, however one can overcome this with a thorough detail-filled discussion of how their experience supersedes their lack of certification. Certifications do matter. Ask anyone that’s had to sift through the resumes listed on MONSTER.COM. And as the industry evolves, and as more and more individuals enter the workforce, they will continue to be important differentiators. In some cases, mandatory. And let those that lack the effort, the attitude, and the baseline skills to attain them, be forewarned: Next to someone with a certification, you’re already behind your competition. 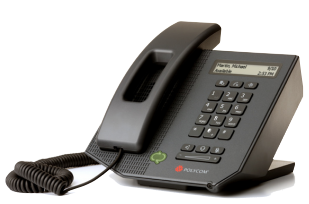 To the right, you see a photo of the Polycom CX300 Deskphone for Office Communicator. It’s a fantastic phone. Now some people in my organization – for a very long time – preached the elimination of deskphones in favor of “USB-connected headsets” or “small portable speakerphones”. “Why do you need a deskphone?” they say. “Just use a headset!” This is of course much hooey and just plain makes me resentful. ATTENTION WORLD: I WANT A FRICKIN’ DESKPHONE. I’ve been using a deskphone for more than 28 years. I’m comfortable with it. You don’t change a person’s behavior overnight & the audacity of those that think that they can force a “change of the rules” in the name of their purported paradigm shift on users is simply pure arrogance. There is little incentive for users to do something so weird as to use a firkcin’ headset day-to-day instead of a perfectly good deskphone when it’s perceived as an annoying change. As an office worker, I get up a lot – for whatever reason be it to stretch my legs, get coffee, pick up a printout, visit coworkers, pick up lunch – and this means taking off & putting on my headset over and over again when I try to use it. A UC-enabled deskphone for individuals like myself would be such a nice transition. I love my deskphone & I love my old CX200. (The CX300’s predecessor) I’ve gone so far as to BUY extra CX200s for my coworkers to get them endeared to Unified Communications and it’s worked. I hope some others follow suit and figure this out quickly because I’m getting tired of hearing about end users that hate the headsets they’ve been given. The CX300 and it’s big brother the CX700 are the key to bridging people over to the world of superior Unified Communications. Of this, I am certain. Fantastic. The University of Sports Criminals got stung on Southland the other night on TNT. The latest episode of TNT’s "Southland" issued a fairly bracing indictment of USC, with a plot about a pampered and protected football star suspected in the murder of a student. Although the school was called SULA, it was clearly meant to be USC. Hell, DirecTV even referred to the victim as "a USC student" in its onscreen description. Beyond the image of a university odiously building a cocoon around one of its star athletes, the episode featured some barbed dialogue from the detective played by Regina King about the rich private school, "this beautiful campus in the middle of the ghetto." As a resident driving by, she said, it "might as well have been Buckingham Palace: You can look but you can’t go in." Given that USC is under investigation for possible NCAA rules violations surrounding its football program, one could easily dismiss the hour as a "Law & Order"-style "ripped from the headlines with a twist" affair and not such a big deal. But given the school’s significant alumni presence in Hollywood and active outreach, about all you can say is, "Ouch." Beyond that, it was another terrific episode, with more strong work from Ben McKenzie and Michael Cudlitz. "Southland" has also succeeded in making Los Angeles — in all its ethnic, socioeconomic and geographic variety — a major character in the show. So well done. And I’m not just saying that because I’m a UCLA grad. 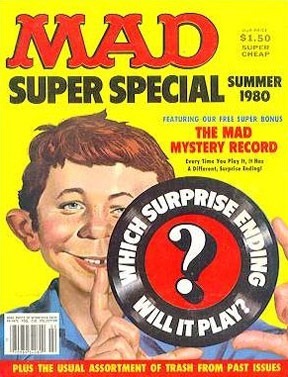 When I was a kid, I like my friends loved to read Mad Magazine. I picked up a $1.50 mega-issue one day back in 1980 and to my delight there was an actual plastic record in it. It was called a “flexi-disc” and was basically a thin piece of square black plastic that bent & warped very easily but could be placed on a 33rpm turntable and played like any other record. 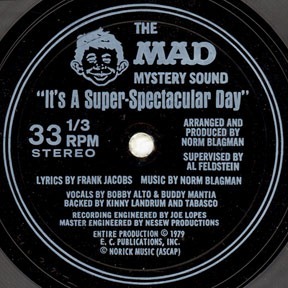 The flexi-disc/record was entitled “Super Spectacular Day”. What made this record special however was that depending on where the needle was when the song was playing, you could end up with COMPLETELY DIFFERENT ENDINGS to the song. Seriously! The song could playback one of EIGHT different endings depending on how the needle of the turntable went, which was actually only somewhat random, meaning that there were often endings that rarely if ever got played. Y’see the “randomness” of the playback was determined by the needle hitting a groove in the record that wasn’t really a groove. It was basically sheer, ungrooved area of the disc that allowed the needle to float randomly for a brief second and land on one of 8 grooves “end grooves” after rotating through the sheer area of the record once. This provided a unique level of randomness to which “end groove” would be played back however there was definitely a predisposition as to which would be played back, simply because some grooves were easier to hit than others. As a result, I would play that disc over and over and over and over and over just to try to hear all 8 endings. Of course I never had the lyrics or anything so listening to the endings were quite a surprise whenever I managed to hear one that I hadn’t heard before. This all happened in the 6th grade for me. For the past 30 years, I have had the song from this disc stuck in my head. I’m not joking. All throughout my life, I’ve had moments where this song has sprung up from my memory at the strangest of moments. Usually during times of stress, boredom, work, or just plain “time-to-myself”. I can remember when I was a sophomore in high school, this song would creep into my brain during ultra stressful oral Spanish tests. I remember having this song pop into my head during a long walk from the Student Commons back to my dorm when I attended UCLA for my undergrad. I recall humming this song while moving furniture into my first new apartment after getting my first job out of college. And just a moment ago, I found myself humming the song while in the kitchen of my condo – 30 years later – now that I’m married and have a baby boy. But the difference is, today, I have the Internet at my fingertips. So on a complete shot in the dark, I decided to BING the search term, “MAD SUPER SPECTACULAR DAY”. Lo and behold, there it was. Back in 2006, someone published some photos of what that very magazine looked like along with a photo of what the flexi-disc looked like. BTW: If you look at the disc photo, you can see the back area in which the needle would play. There is light “white” groove in the middle – that’s the sheer area that I was talking about that provided the random jump to one of 8 different endings. ANNNNND… SOMEONE RECORDED THE MUSIC! But to my surprise someone actually digitized all 8 tracks! No one knows who it was that did it or where it was they got it from (I mean, who really saved that disc? My disc, as I recall was in TERRIBLE shape, because I’d played it over and over and over again and the disc’s grooves had been overplayed after a while) but sure enough, there it was for download. I’ve had some problems playing the MP3s back. It seems like the same ending (#2) is played back for many of the recordings… that being said, 3 of them appear to be unique and that’s better than nothing. However given the quality of the recordings, there’s very much a distinct possibility that the recordings came from someone at Mad itself. If so, thank you so much Mad. This is definitely a blast from the past for me. We have always known umeboshi as a pickled plum but it is actually a Japanese apricot, prunus or Armeniaca mume. If you examine the pit, it resembles an apricot more than a plum. So how are umeboshi made, you ask. From mid-June to mid-July, the rainy season in Japan , the fruit is soaked in water to get rid of its bitter taste. Then it’s drained and wiped dry, and sprayed with shochu, or Japanese distilled rice liquor. They are then put in a container for pickling, mixed with salt and weighted down with a heavy stone. Pressing the fruit down is a very important in the making of umeboshi, which takes about six weeks. After that, perilla leaves (beefsteak) or shiso are washed, sprinkled with salt, all excess liquid squeezed out, leaves broken apart and combined with the salted ume. The heavy stone is again placed over the mixture, which is allowed to pickle for another week. During a sunny day at the end of July, the fruit is dried outside for three days and nights. The center of umeboshi industry is in Ryujin village, in Wakayama Prefecture , on the main island of Honshu . Their traditional method of making umeboshi is a ‘lactic-acid fermentation’ process, one of the oldest and safest ways of preserving food. Wakayama umeboshi is mellow and not as salty as the typical umeboshi we know. Lactic-acid-forming bacteria grows and creates an acidic environment, and emits carbon dioxide that contributes to the favorable anaerobic condition and further stimulates the growth of the good bacteria. Salt, rice vinegar, and shiso leaves are added. After a year of aging, the remaining red liquid is bottled and sold as umeboshi vinegar. This condiment is versatile for making dressing and is available locally at the natural foods stores and some supermarkets. 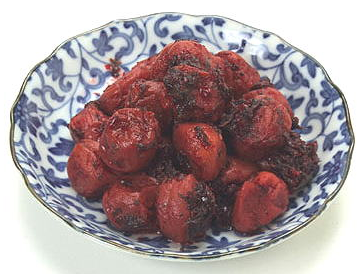 The first umeboshi was found in China , where a dried smoked plum, called ubai, was discovered in a tomb more than 1,000 years ago. It was used to prevent fatigue, purify water, rid the body of toxins and cure dysentery, typhoid and food poisoning. The first umeboshi appeared before the Nara period in the years 710-794, and was first introduced as a medicine. During the samurai period, umeboshi flavored the samurai’s rice and vegetables, and purified his water and food. It also helped samurai suffering from battle fatigue. About 200 years ago, the Japanese made a plum extract, or ‘bainiku ekisu.’ They made this extract by slowly cooking sour green ume fruit to obtain the most active ingredients in a highly concentrated form. The resulting dark, sticky, thick liquid is mixed with hot water and honey and drunk as a tonic. The dried form of this extract is formed into pills and called ‘meitan.’ Because this extracting process contains no salt, it is a treatment for high blood pressure. Yet something else I found in my inbox that seemed somewhat meaningful to me being that Sheepa’s getting very old. 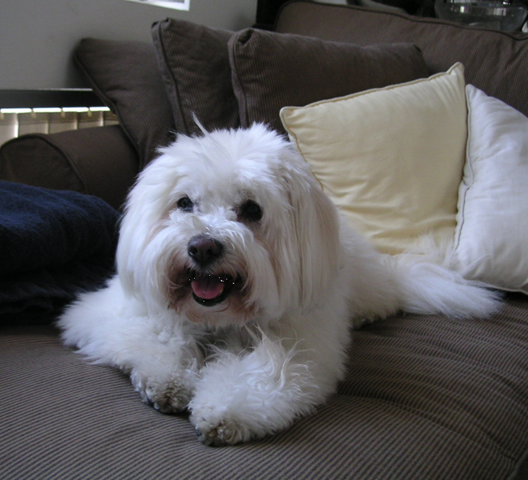 We approximate that he’s about 15 now. I feed him joint medication everyday now and I’ve greatly loosened up what we allow him to eat… for example: He now gets coldcuts to help the medicine go down. He stumbles around quite a bit and finds it difficult to walk in the mornings just to go out. I carry him a lot now just so that he can make it up and down the steps of the entryway to our condo. Our dream of him walking with us during walks with our baby, Kyle, seems to be a short-lived one as he can’t really keep up. So I’m thinking of converting Kyle’s infant stroller into a dog walker. He can’t hear commands any more – his hearing is gone. He can’t see very well because of the cloudiness in his eyes but he can still see movement and he still follows my basic sit, lie down, and go-this-way commands if he can see them. And here’s what I received in the mail. On the ultimate difficult journey, go with me please. Never say you can’t bear to watch Don’t make me face this alone. Everything is easier for me if you are there, because I love you so. You are currently browsing the Kurt's Thoughts blog archives for March, 2010.